Whether you’re prepping for a great weekend trip to the slopes or for a full season of snow sports, having great snowboard and ski equipment is key. If you’re wondering what you’ll need, here’s your ultimate gear checklist to prep before you head downhill. There are many different types of skis: those made for navigating the backcountry, carving through fresh powder, riding on groomed trails, and many more. If you’re thinking of buying only one style, all-mountain skis are the most versatile equipment, as they work well in a variety of snow conditions. If you’re serious about buying, rent a demo pair at a ski shop first. 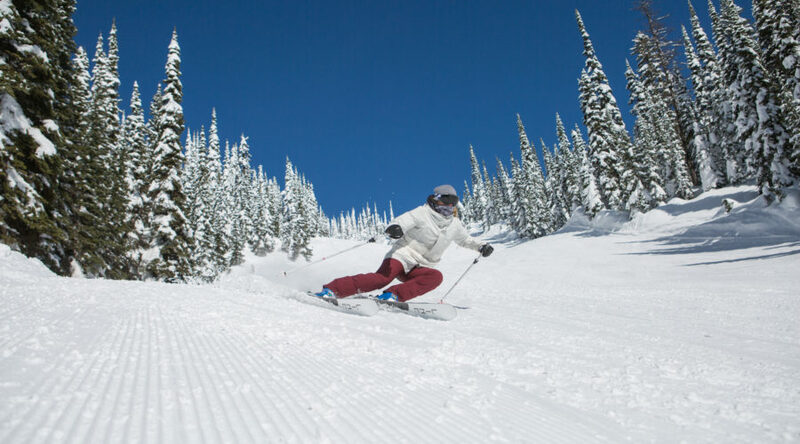 Buying tip: Ski length depends on height and skill level. The ski binding is the metal contraption that secures a ski boot to a ski. Consider ease of use with your purchase. Nothing can be more of a nuisance on the slopes than wonky bindings. Get a professional to attach and fit them to a new pair of skis and boots. It’s incredibly important to get the right fit in a pair of ski boots. Consider flexibility and additional features like performance and comfort. If your boots don’t properly fit your feet or skiing style, even the perfect weather won’t make your day on the slopes a fun one. Bend your elbow at a 90-degree angle out in front of you and grip the pole so it stands straight up from the ground. This is the length of pole you should buy. Consider grip, material, and look when picking out a pair of poles. There is an abundance of snowboards available these days and if you don’t know exactly what you want, the shopping process can be overwhelming. You’ll want to choose a deck that properly fits your riding style and personal preferences. Fortunately, snowboards usually fit into three categories–mountain, freestyle, and powder–that give you an idea of the equipment’s intended use. Mountain boards are versatile and stable, freestyle focuses on riders who like to do tricks, and powder offers optimum float when staying on top of the fresh snow is top priority. Snowboard bindings are your direct connection to your snowboard, transmitting your muscle movements to your board. Well-aligned binding angles and positioning on the board provide better balance and help boost bigger jumps. Tip: Don’t hesitate to adjust your bindings. Honing your stance can take lots of trial runs, so adjust accordingly! Besides the snowboard itself, snowboard boots are the most important part of your snowboard equipment and you should take care when choosing the perfect ones for you. Luckily, there are various types and styles that help optimize your performance and keep your feet dry and comfortable. Be sure to select boots that match your typical riding style and the snow conditions you most frequently encounter. If you’re a sweat monster, your base layer should have a great wicking ability. Materials like wool and certain synthetics fit well and help regulate your body temperature. For pants or leggings, look for those that end mid-calf so they don’t tuck into your boots. Grab an extra layer of insulation for those colder, windier days. Jackets are most important for waterproofing and providing a final layer of insulation. Your outer layer is also a handy way for your ski group to identify you on the slopes, so don’t be afraid to pick a flashy color! If you’re worried about getting too hot on the slopes during spring skiing, opt for a shell so that your base and mid layers control the insulation. Weather in the mountains is changeable and can vary throughout the day, so how you dress for your time on the slopes is vital. You’ll want to keep your lower half dry because everybody falls at least once, so opting for waterproof pants is always a good idea. Warmth and breathability are also key to keeping you comfortable, especially on the lifts. Gloves and mittens are some of the most important accessories for snowboarding because numb fingers can certainly ruin a day out on the mountain. Features you’ll want to consider before making a purchase include whether they are waterproof, flexible, warm, and easy to put on and remove. Mittens typically offer more warmth due to your fingers being in the same compartment. However, gloves provide more mobility. Sock technology has come a long way in the past couple years to provide snowboarders and skiers with better fit, breathability, and moisture management. Foot comfort is crucial when snowboarding, and having the right socks affects how your boot will fit. It’s tempting to skip wearing a helmet, but whether you’re a newbie or a seasoned boarder, there’s no messing around when it comes to wearing a helmet. It’s key for protection, extra warmth, and even stylish flair. Trying to keep the sun (or falling snow) out of your eyes? Grab a pair of ski goggles. Look for a pair that has lenses for bright and low-light conditions, and be ready to try a few on to see what fits you best. Tend to run on the cold side? Keep your neck cozy while speeding downwind with a knit neck warmer. Still sounds too cold? Wrap your face up to your eyes (and over the top of your head) with a cozy balaclava. Don’t miss out on the little things before hitting the slopes. Pack some sun protection—it’ll be reflecting off the white snow for twice the brightness, so sunscreen is vital for your exposed skin. It’s dry out, so bring some lip balm as well (bonus points if it has SPF built in, too!) If you love to capture your latest adventure, pack a GoPro and a or so it can capture your downhill action. Wondering where to put all this stuff? Don’t forget a snow-ready backpack like the , made for skiing and snowboarding.